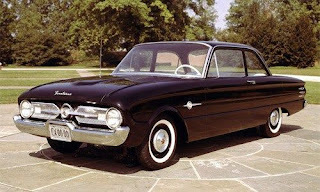 While American Motors and Studebaker were quick to recognize the trend to smaller cars, GM, Ford and Chrysler were asleep at the wheel. 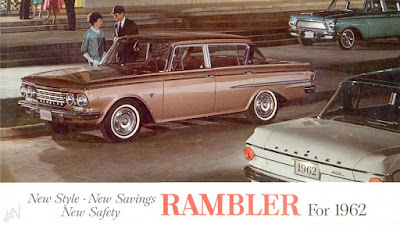 When they finally woke up from their long winter’s nap, Chrysler and Ford decided to target Rambler and Studebaker’s Lark. General Motors decided to go head to head with With Wolfsburg. 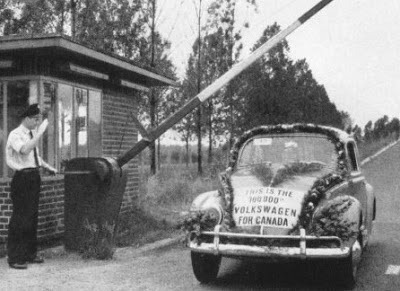 By 1959, West Germany’s Volkswagen had climbed be the third best-selling automobile in Canada. GM coveted Volkswagen’s market share. The behemoth would battle the Beetle. Edward N. Cole had been general manager of Chevrolet since 1956. Cole was a personal friend of Heinz Nordoff, who had worked at GM for a decade before returning to Europe, as Volkswagen’s chief. Cole visited his good friend in Wolfsburg and carefully studied the Beetle. Since Chevrolet’s compact was still on the drawing board, something needed to be done immediately. Already, one out of every four automobiles sold throughout the Dominion was imported from Europe. For a quick fix in this burgeoning market segment, GM Canada relied on Vauxhall and the badge-engineered, Canada-only Envoy. 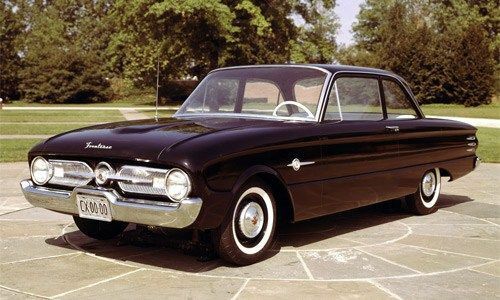 was personally chosen by Cole—a compilation of Chev’s two most recognizable and most popular models, Corvette and Bel Air—Corvair. The name already belonged to the corporation’s name bin—it had first appeared on a dream Corvette that dazzled 1.9 million North Americans during the 1954 GM Motorama. Every aspect of GM’s pint-sized warrior would be unique. Designers would give their import fighter a stylish, modern look and engineers would make sure it was technically sophisticated. 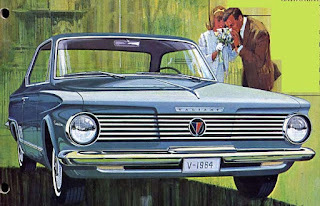 For secrecy, prototypes were code-named Holden Special, Holden being GM Holden of Australia. Under the guidance of engineer Kai Hansen, the aircraft-inspired, rear-mounted and air-cooled engine set the entire auto industry on its ear. Six pistons were laid out flat, rather than being horizontally opposed. Rated at 2.3 litres (140 cubic inches), 59.6 kiloWatts (80 horsepower) or 67.1 kiloWatts (95 horsepower), it featured a two-piece crankcase, individually cast iron cylinder barrels, with finned aluminum heads. Now, General Motors was no stranger to the rear-mounted, air-cooled engine layout. 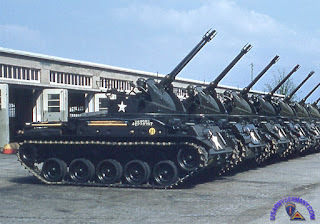 The corporation had created the M-42 Duster tank for the US government. A total of 3,700 machines built between 1952 and 1960. Rugged and reliable, they served in the Korean Conflict and the Viet Nam War. Corvair received Quadra-Flex independent coil suspension on all four wheels. Power steering was not needed as the front end was much lighter than most. Cole rejected the idea of equipping the cars with manual transmission but it was forced on him by superiors. Cars equipped with the two-speed PowerGlide automatic transmission, featured a dash-mounted gear selector. William ‘Billy’ Mitchell put the designers through their paces, too. 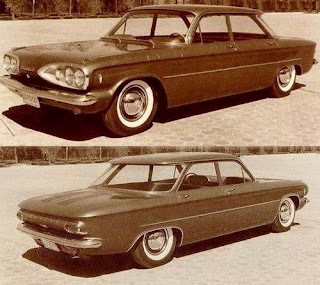 With 4 572 millimetres (180 inches) in overall length and a 2 743 millimetre (108-inch) wheelbase, there was nothing in the field that remotely resembled the Corvair. 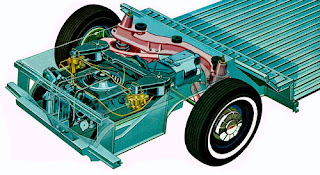 Body by Fisher was monocoque construction—dubbed Monostrut. The nose was kissed with a concave panel dressed up with the Chevrolet emblem affixed to the centre, a no-nonsense bumper, quad headlights and a splash of brightwork. From the side, the windshield canted smartly. The roof ended at the wraparound rear window. A strip of brightwork was applied just beneath the beltline. A subtle convex panel, with the right amount of faring at both ends, accentuated the daringly streamlined look. The rear deck was noticeably longer than in many other cars. The engine cover rolled gently into the brightwork strip that nearly wrapped the shell. A pair of windsplits were impressed into the space between the rear window and the hood. Two louvered panels were for air intake. The nameplate was spelled out at the trailing edge of the deck. Round taillights projected from the reverse-canted body panel. The license plate was rear and centre. Below the bumper was the engine exhaust panel. Resurrecting the ghost of Nashes past, auto press pundits dubbed the styling as ‘bathtub’ in look. What was good for the goose was good for the gander. GM explored the possibility of marketing its smallest bowtie to Europeans. 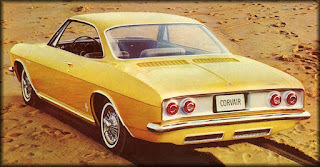 Corvair was sent to auto shows in Britain and continental Europe. There was little interest, however, on the part of prospective purchasers. Advertising teased the public for months in advance. 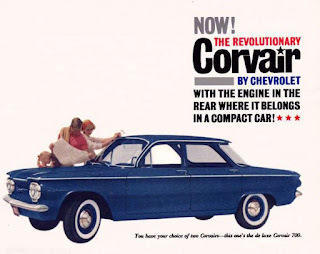 Corvair was marketed as ‘revolutionary’. 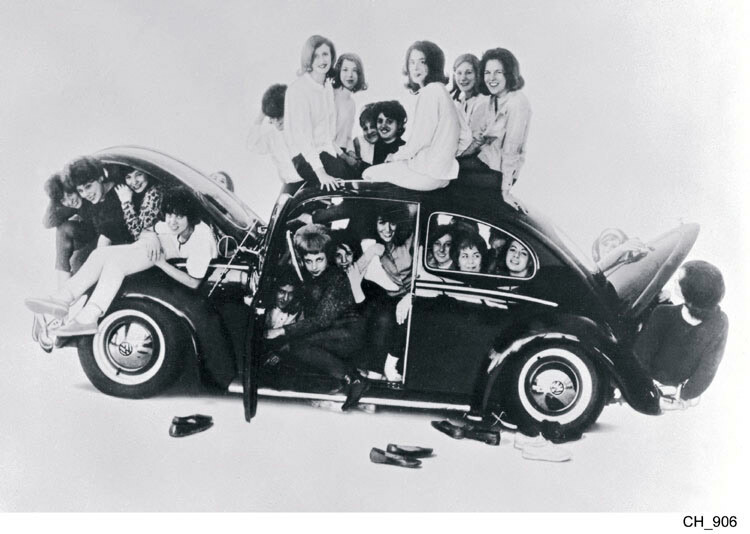 It was the car “With the engine in the rear where it belongs in a compact car.” All publicity was discreetly aimed at Volkswagen, without ever naming the competition. 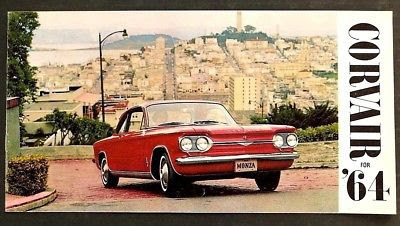 When launched, Corvair joined the battle line with eight other compacts built in Windsor, Oakville and Hamilton. Production got off to a slow start. A steel workers’ strike in the US triggered parts shortages in the new $10-million Oshawa plant. 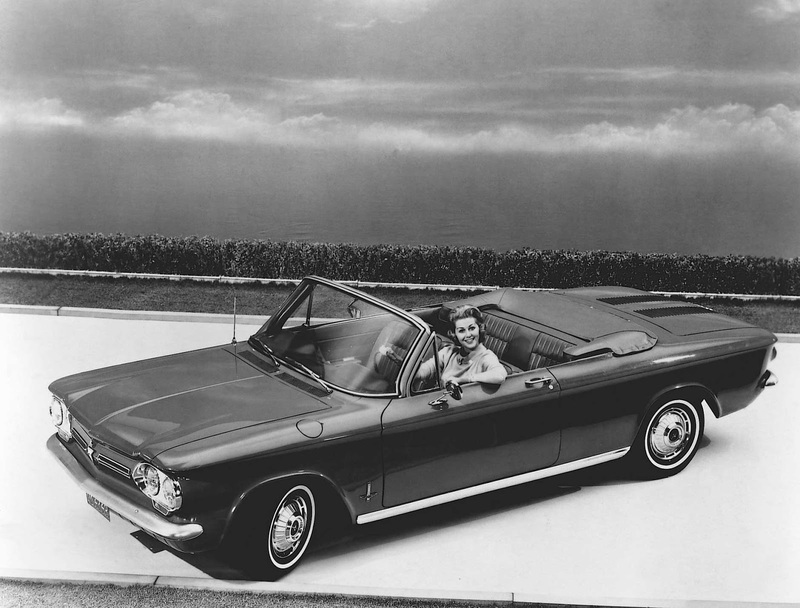 Records show that a single Corvair finally scooted out the doors in November. There was nowhere to go but up; December’s total was 176 units and rose to 921 in January. Competitively priced with other domestic compacts, Corvair ranged from $2,145 for the 500 two-door Coupe to $2,275 for the four-door sedan in the 700 series. In response, VW’s base price was slashed by $205. For an extra $145 one could buy a Beetle with a sunroof. Wolfsburg’s most expensive ride was the $2,345 the Cabriolet. 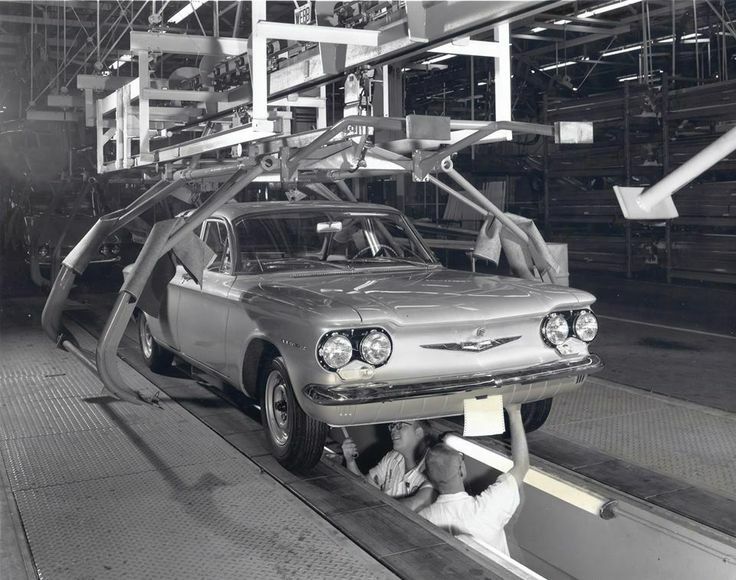 Corvair’s 1960 model year ended in May, with 3,261 being built. Most popular was the 500 sedan, which found 1,172 buyers. The 700 sedan took a close second—only seven units behind the 500. 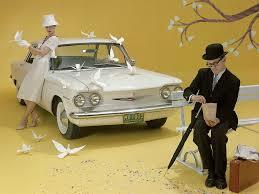 A total of 362 of the 500 Coupes were built and the final number of 700 Coupes was 562 units. Results were disappointing. 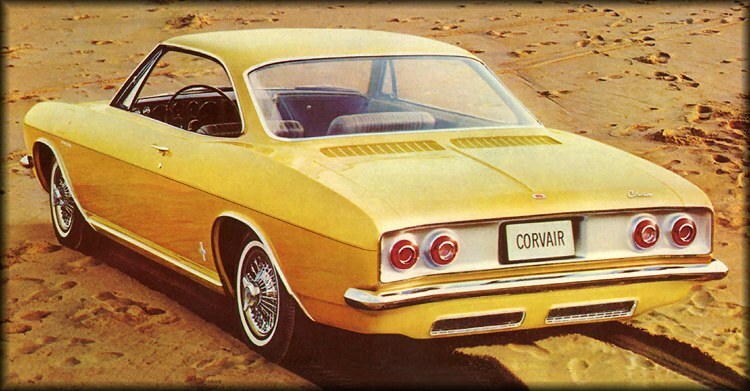 Lowest on the ladder of domestically-built compacts, Corvair took 10.6% of the market. Ford Falcon and its Frontenac cousin reigned as the compact kings, garnering 57%; Studebaker’s Lark was second with 16.8% and Valiant snagged 16.4%. Canadians could fill The Forum full of new small car offerings but no dent had been made in Volkswagen purchases. Customers had been brand loyal since 1952. 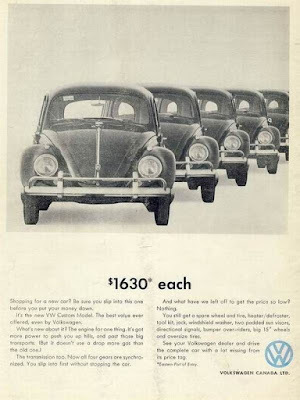 VW added heaps of conquest sales every year. With sales circling the 30,000 mark, Volkswagen nailed the Number Three spot behind Chevrolet (full-sized) and Pontiac. 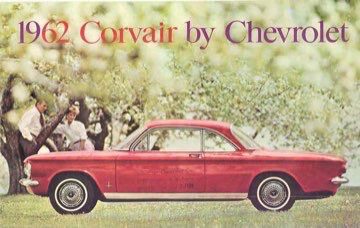 Chev-Olds dealers quickly discovered Corvair to be a tough sell. The cold, hard fact was that Corvair was not perceived as an economy car. Those who did buy weren’t looking for a niche vehicle. 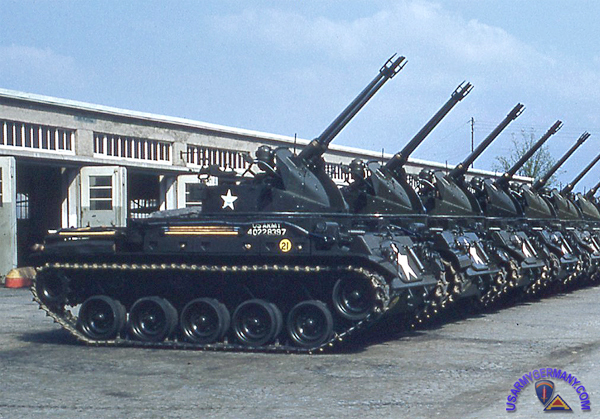 To beef up the line, a pair of Lakewood wagons was added for 1961. The cargo bay held 1.9 cubic metres (68 cubic feet) of room and a snappy, better dressed Monza appeared in coupe and convertible variants. Still, more needed to be done. 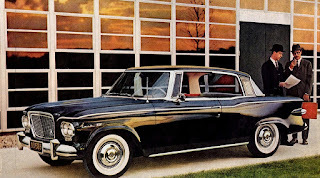 The dealer body demanded GM create more conventional compact offerings to compete with Rambler and Studebaker’s Lark. Management saw the wisdom in this. Workers in Oshawa rolled out 1,530 upscale Monza coupes and 612 Monza sedans. 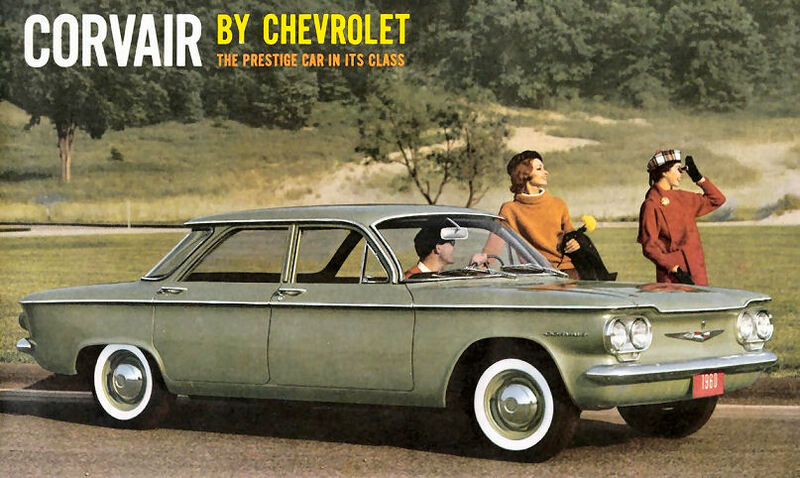 The 700 sedan still led the popularity pack with 2,213 units hitting the nation’s highways and byways. Least popular was the 700 Lakewood. Only 547 of the pint-sized wagons were shipped. 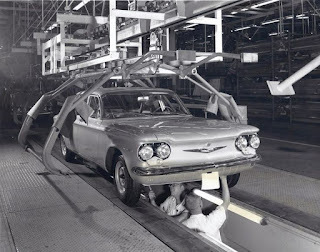 At the end of the 1961 season, Corvair production reached 6,981 units. 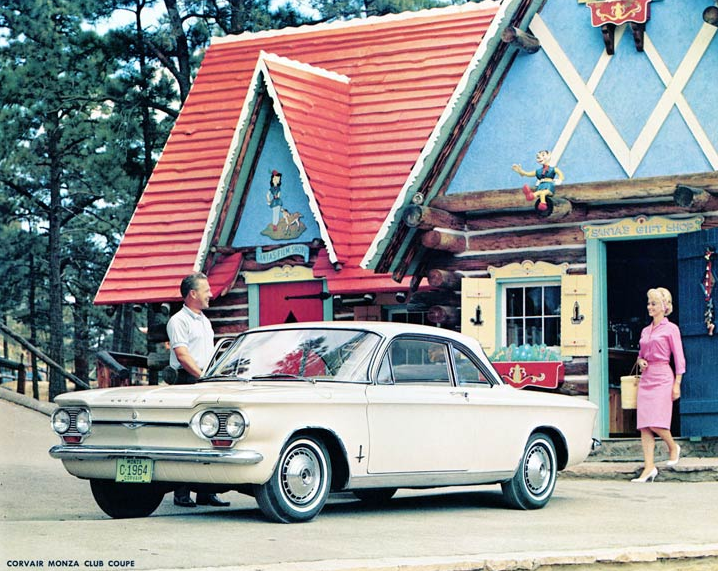 When Corvair arrived on showroom floors for 1962, it was accompanied by more traditional small car kin. 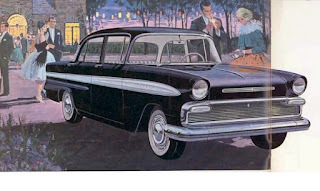 Chev-Olds dealers were given the Chevy II and Pontiac-Buick dealers received the homegrown Acadian. 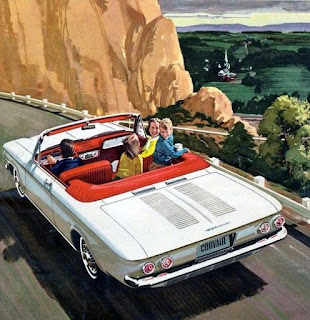 Just to be safe, the Pontiac Tempest, the Oldsmobile F-88 and the Buick Special were imported from the US. These cost between $200 and $500 more than Chevy II and Acadian—and found few buyers. 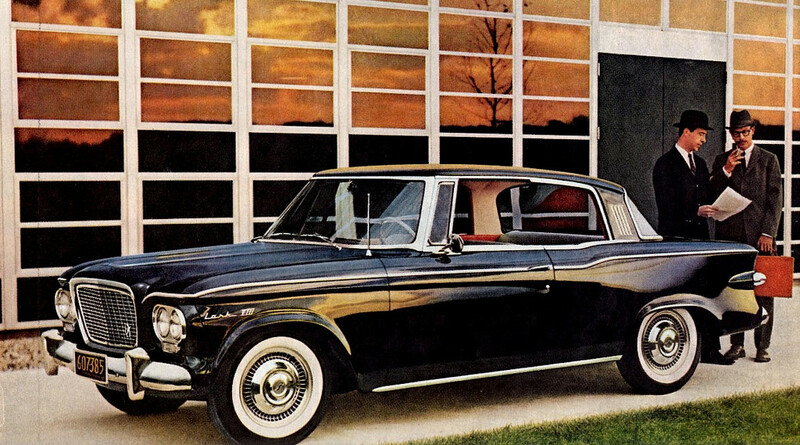 For 1962, the bare-bones 500 line was pared to a single model—the coupe. Workers built 903 of them. 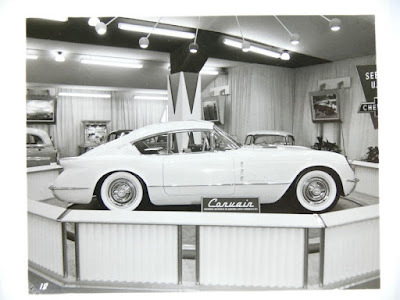 The 700 series racked up 758 coupes, 1,656 sedans and most rare, a total of 68 Lakewood wagons. The manual transmission that was unwanted in 1960 would give the Corvair a new lease on life. A four-speed gearbox, mated to a sweet super-charged engine, was included in the sporty Spyder package. Suddenly, the Corvair was the working class Porsche. The Monza family grew, with the addition of a natty station wagon, of which 205 were shipped from Oshawa. The leader of the Corvair pack was the coupe with 2,772 builds, followed by 1,020 sedans. 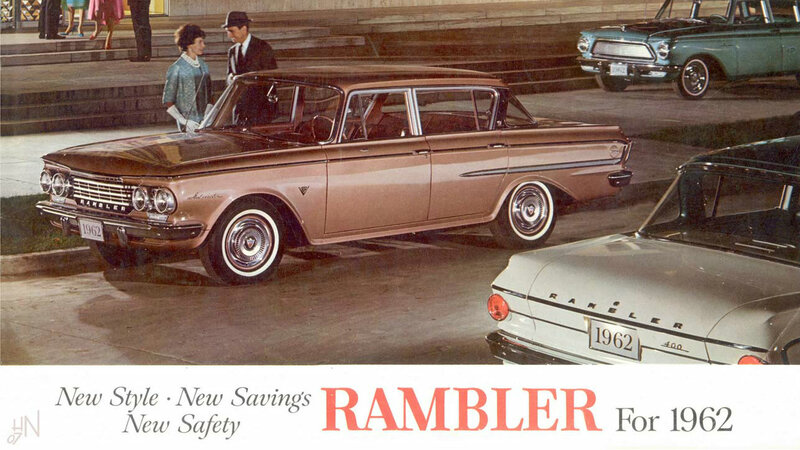 At the end of the 1962 selling season, Ford’s Falcon and Rambler took the number one and two spots in the small-car field with 18, 215 and 17,343 built. 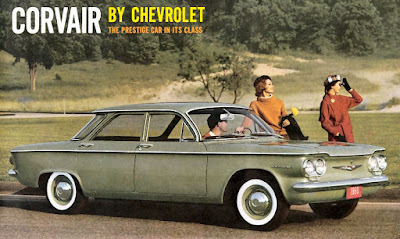 Chevy II chalked up 15,876 units built, Acadian production was 13,010. 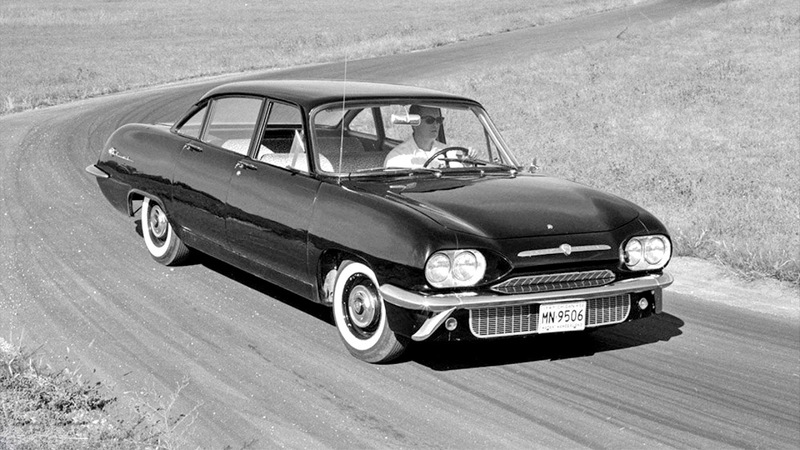 Corvair ranked dead last in the compact segment—after the Studebaker Lark— with only 6,574 cars built. Virtually unchanged in appearance, the 1963 Corvair lineup included the 500 coupe, listing at $2,343—of which 843 were built, and 665 coupes along with 1,059 of the 700 series sedans headed to St. John’s and Victoria and points between. Monza was the biggest winner with 2,821 coupes, 799 sedans—and in the nick of time—693 convertibles. The sassy ragtops could be snapped up for $2,694 f.o.b. Oshawa. The 700 series lost its Lakewood wagon as did the Monza. 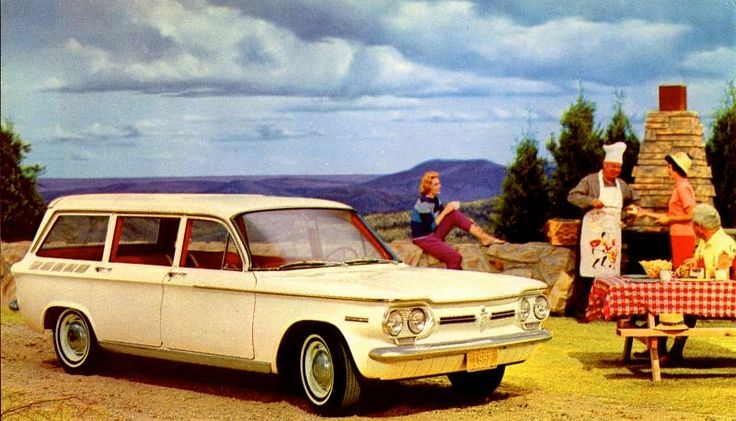 Killed by friendly fire, the Acadian and Chevy II laid waste to the Corvair wagon market. When it was time to tally the 1963 production stats, 6,880 Corvairs had been built. The optional Spyder package for the coupe and convertible continued to be of interest with 693 and 793 built, respectively. Total production climbed to 6,800 units. When Corvair appeared for 1964, it was the fifth year of the same body shell. What new and exciting five years ago, was now old hat with the public. The face wore a more prominent faux lightbar. The bowtie was featured in a triangular emblem, hung from the -pseudo lightbar. Corvair was spelled out in block letters at the leading edge of the trunk. Technical changes included finned brakes and reworked leaf springs. The rear suspension revamped. Taillights were tweaked. Interiors were refined. The instrument panel was slathered in brightwork. the glove box wore a new nameplate and Monza models sported European inspired map pockets. Now Corvair offered seven models spread over four series. The previous Spyder option was now the full-fledged Monza Spyder. Engine displacement was increased to 2.7 litres (164 cubic inches), whipping up 70.8 kiloWatts (95 horses) in the base mill. Transverse rear leaf springs gave a better road grip. Rear brakes were now finned. There were subtle differences in the exterior. The chrome bar that ran across the snout grew thicker. Corvair—in bold block lettering—adorned the hood and deck. The Monza Spyder two-door sedan sold for $3,080 and the convertible for $3,560. A trio of snappy Monzas were next; the Club Coupe sold for $2,703; the four-door sedan cost $2,767 and the ragtop pegged at $3,183. The lone offering in the 700 series was the four-door sedan with a price tag of $2,508 and the modest 500 Club Coupe, listed at $2,364 with its weight of 1 110 kilos (2,449 pounds). 1,050 of the 500 Coupes were built. The 700 Coupe was deleted but 1,022 of the sedans left the factory. 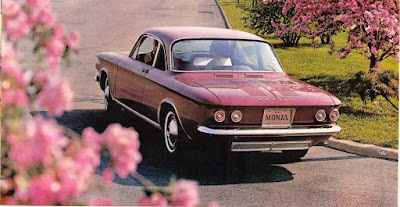 Monza took the lion’s share of production in Oshawa, with 3,190 coupes, 892 sedans and 559 ragtops. When reporting for 1964, Corvair production rose to 7,369 units, its best ever. Volkswagen dropped to fifth place in calendar year registrations, behind Valiant and Rambler. 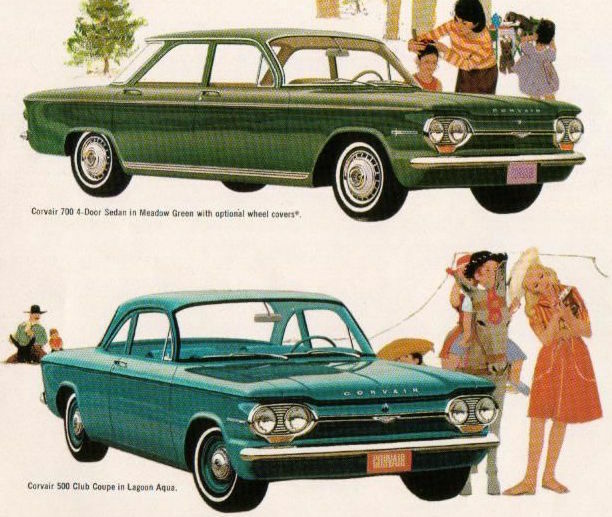 When the plant shut down for model changeover, there would be an all-new Corvair to roll out the doors. Monza Spyder cvt $3,560 2,664 lbs.